In a lush, hidden mountain valley just a few miles from where he used to go trout fishing as a boy, Dr. Sonny Hardman has splashed the landscape with broad swaths of red and white fruit. Rows of Riesling, Merlot, Seyval Blanc and Cabernet Franc flow in tandem with ancient hills and follow curvaceous Blue Ridge Road on a parallel path. It’s a small corner of a larger world taking shape in North Georgia, where a budding wine industry is emerging. Acres of European vinifera and French-American hybrids are thriving in the sandy clay soil of the sloping Appalachian terrain, producing award-winning vintages. The new wave of viticulturists and winemakers, with their rolling hills, mountain vistas, French chateau-style wineries and tasting rooms, are luring tourists by the busloads to a region that is gaining a national reputation for fine wines. The stereotypical Georgia wine is the teeth-numbingly sweet muscadine juice, usually made by grandpa and slugged from a plastic milk jug. Georgia is still the world’s leading grower of muscadines, with more than 1,100 acres planted. Nouveau viticulturists like Hardman, a pathologist from Athens, along with trained professionals like David Harris of Blackstock Vineyards and Andrew Beaty of Habersham Winery, are aiming for a more sophisticated palate. Although Beaty, Habersham’s winemaker, says he prefers beer to wine: “It takes a lot of beer to make wine,” says Beaty, whose deadpan sense of humor is as dry as a good Cabernet Sauvignon. What he means is, a well-lubed winemaker is a happy and productive winemaker. With less than two-dozen substantial non-muscadine winegrowers at this stage, Georgia’s industry barely qualifies as nascent. But they’re trying, says Steve Gibson, who manages Habersham Winery for founder Tom Slick, and serves as president of the Winegrowers Association of Georgia. Agricultural extension service estimates have put the industry’s economic impact at close to $15 million. Gibson, who serves on the board of directors for Wine America, the national lobbying association representing 700 wine growers in 48 states, compiled some figures for a conference in Washington, D.C., earlier this year. In 2002, Georgia had about 200 acres of vineyards (vinifera and French hybrids, i.e., the good stuff) and produced more than 100,000 gallons of wine for a value of $6 million. That doesn’t include gift-shop sales, hotel rooms, meals or any of the other multipliers used when the numbers wizards calculate economic impact. It’s a small but rapidly growing crop of agri-entrepreneurs. In 1880 Georgia was the sixth largest winegrowing state in the U.S. with almost 3,000 acres of vineyards and nearly 1 million gallons of wine. But the wine industry died a quick death in 1907 when the state voted in favor of Prohibition, 10 years ahead of the rest of the country. The second coming of viticulture in Georgia was ushered in by Gay Dellinger, who planted three acres of vinefera and French-American hybrids near Cartersville in 1979. The old adage in winemaking is that it takes a large fortune to make a small fortune. But Dellinger added five more acres at her Split Rail Vineyards, sold her grapes to a winery in Mississippi and her Pinot Blanc became the first Georgia wine to medal at a national competition. Dellinger operated the vineyard for 12 years. Today it is pasture land in a 60-acre environmental preserve. The two oldest and largest vineyard/wineries in Georgia are Habersham, in Helen, and Chateau Elan in Braselton. Pharmaceutical kingpin Donald Panoz saw the first vines go in the ground in at his Chateau Elan in 1982 and opened his 16th-century style chateau and winery several years later. Chateau Elan, with almost 200 acres of vineyards producing about 40,000 cases of wine a year, is the largest winery in Georgia. The best might be Habersham, which planted vines in 1980 and opened its first winery in 1983. Tom Slick named the vineyards and winery after the county in which it was founded, although at that time Habersham was a dry county. He didn’t have a license to make wine after his first major harvest, so he kept the grapes in a refrigerated truck for six weeks. Slick’s efforts to convince local politicians to grant him a license to open his winery made headlines and provided chuckles across the nation. In trying to state his case, Slick argued that even Jesus made wine. “One city councilman in Clarkesville who voted against us said, ‘Jesus might have turned water into wine, but he didn’t have to run for re-election in Clarkesville,'” Slick recalls. Meanwhile, the past 20 years have been almost miraculous for Slick’s little empire. He eventually did open a winery in the city of Baldwin, which did have a local option, and the facility remained there until 1998 when Slick moved the winery to a 300-acre property just outside of Helen. Today the development is called Nacoochee Village, and it includes the winery, antiques and collectibles shop, coffee shop and newsstand, outfitters store and a fine-dining restaurant, Nacoochee Grill, operated by former Atlanta restaurateur Gene Marra, who serves Habersham wines. “You want to talk about economic development? There wouldn’t be a Nacoochee Village without the winery,” says Gibson. Slick, who helped form the Georgia Grape Growers Association, lobbied the state legislature to pass the farm winery law in 1983, which reduced the winery license fee from $1,000 to $50, permitted production on a large scale and allowed retail sales at wineries and other locations. Approval was eventually given for Sunday sales, a slam dunk in the Bible belt. For the most part, North Georgia’s winegrowers and makers are a close-knit community, banding together at season festivals, combining their muscle to market the region and/or battle antiquated blue laws. Last year they re-organized their efforts, creating the Winegrowers Association of Georgia to lobby for more exposure and dollars. Over the years they’ve met with limited success. Habersham Winery’s Steve Gibson and Blackstock’s David Harris are usually at the epicenter of political efforts to support the industry as a whole, while Doug Paul of Three Sisters is basically going it alone. He resigned as an officer of the Winegrowers Association because of professional and philosophical differences with association leadership. Paul’s independent and outspoken nature has irked some of his peers, and his product is speaking loudly as well. The nation’s leading wine publication, Wine Spectator, rated Three Sisters’ Merlot as the best of its kind in Georgia last year. What makes some Georgia winemakers really want to whine, however, is what they perceive as a lack of support at the state level. For one thing, plans for the University Extension service to hire a state viticulturist have been put on hold for budgetary reasons. And the Georgia Wine Highway project has been a disappointment to state industry leaders like Gibson and Harris, who got the Department of Transportation to create road signage based upon prototypes in wine-friendlier states like Virginia and North Carolina, which featured winery logos and names, hours of operation and mileage markers. Currently, the telltale Georgia Wine Highway signs, with their pictures of grape clusters, are located on intermittent routes through North Georgia, some with directional arrows, some without. But the state association has received funding through the Departments of Community Affairs and Agriculture for a Web site and brochures. The Georgia Wine Highway, incomplete though it may be in terms of signage, links 20-year-old veterans like Chateau Elan and Habersham with newcomers like Crane Creek Vineyards in Young Harris and Wolf Mountain Vineyards in Dahlonega. The higher altitudes in the north mean vines are less likely to succumb to insect pests like the glassy wing sharpshooter which causes Pierce’s Disease, Public Enemy No. 1 for wine growers. Pierce’s Disease devastated Chestnut Mountain Vineyard, which produced award-winning wines 10 years ago in the Braselton area. Vineyards tend to be at greater risk in temperate winter climates, generally at elevations below 1,300 feet. What North Georgia growers have in their favor are those sloping hillsides and soil that drains quickly, combined with fescue grasses that prevent erosion of the soil. Harris and some of his peers have girded themselves against fickle Mother Nature by using giant wind machines and heaters. Creativity helps. Harris has used a helicopter to fan his vines. Over in Rabun County, John Ezzard of Tiger Mountain Vineyards and Winery has rigged a system to scare away curious bears, complete with bright lights and an audio system. One of the first people Ezzard spoke to when he considered planting a vineyard at his old family farm in Tiger was Harris. At one time or another, most of North Georgia’s growers have picked Harris’s brain. A Georgia native, he is a graduate of the renowned viticulture (grape growing) and enology (winemaking) programs at Fresno State. Formerly the assistant winemaker at Biltmore Estate in North Carolina, Harris has produced award-winning wines as a maker and grower at Georgia’s now-defunct Chestnut Mountain Winery and preceded Beaty as the winemaker at Habersham. In 1996, after spending several years searching for the perfect location, with the right elevation, microclimate and soil, he founded Blackstock, the first of the new vineyards in the Dahlonega area. His farm is the only exclusively vinifera (premium European species) vineyard in Georgia, and his grapes are sought after and have been showcased in a variety of award-winning wines. “Good wine is made in the vineyard,” says Harris, who is exclusively a grower these days. Since planting his vines on 40 acres of White County hillsides, Harris has been joined by several winemaking neighbors. Just down the street over the Lumpkin County line is Frogtown Cellars. A few miles away are Three Sisters Vineyards and Winery and Wolf Mountain Vineyards and Winery. Karl Boegner of Wolf Mountain has created a mini-palace in the mountains, as much a showplace as it is a winery. “Wolf Mountain has set the standard,” says Harris. Boegner, a former executive with Chateau Elan, brings decades of experience in the hospitality business to his role as a vintner. The Wolf Mountain lodge sits on top of a mountain and offers spectacular views of the vineyards. A few miles away is Frogtown Cellars, where Atlanta attorney Craig Kritzer and family are building another luxury showplace and winery scheduled to open this summer. Appellations are viticultural regions distinguished by geographical features, such as soil, water quality and contour, that produce wines with common characteristics — think Sonoma-Napa Valley, or Bourdeaux. Earning the designation (courtesy of the Bureau of Alcohol, Tobacco and Firearms in the U.S.) requires piles of paperwork. These viticultural boundaries not only help wine enthusiasts sound smart when expounding on the differences between regions, but also provide yet another marketing tool for tasting trips. Harris likes “Dahlonega Mountains” as Georgia’s first official appellation. If Georgia does get an official wine name, look for it soon on labels — and highway signs. Fox Vineyards & Winery, Social Circle: Laid low by the dreaded Pierce’s Disease, Fox Vineyards still grows a healthy crop of muscadine and scuppernong, and has Cabernet and Merlot for sale from past vintages. 770-787-5402. Persimmon Creek Vine-yards, Clayton: Born in 2000; has already produced well-received bottles of Riesling. Athens pathologist Sonny Hardman is building a winery in the basement of his mountain getaway in a hidden Rabun County valley. Appointment only. 706-546-4884. 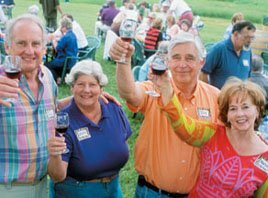 Three Sisters Vineyards & Winery, Dahlonega: Doug and Sharon Paul produce about 4,000 cases of premium wine per season and entertain visitors in a tasting room/gallery with spectacular views of the mountains. 706-865-WINE, www.threesistersvineyards.com. Tiger Mountain Vineyards & Winery, Tiger: Hand-crafted wines include Rabun Red, Cabernet Franc, Malbec, Tannat, Touriga Nacional, Norton and Viognier. 706-782-9256, www.tigerwine.com. The Winegrowers Association of Georgia (www.georgiawine.com) has information and directions for member vineyards. Or see the Georgia Grown site at www.agr.state.ga.us/ggindex.html. Thomas Arvid says grapes are like artists, or perhaps it’s the other way around. “Once the artist has suffered through turmoil and has something to record about his life, then he can paint,” says Arvid. “And grapes have to suffer to make great wine. Go to any of the great wine regions and you find areas where nothing else can grow. Arvid has made a name for himself as a painter of grapes that have suffered and been bottled. His photo-realistic oil paintings of wine bottles are so sharp you can almost see your reflection in the canvas. Now Arvid has a commission list that’s about 30 paintings deep. The subject matter is pretty much the same — wine. But it isn’t about the wine. Well, not entirely. “It’s about getting together with friends and consumption and sharing,” says Arvid.